I have been having a busy couple of days, and I haven't had the time to post anything new here on the blog for a while now. To break up the lazy spell a bit, I thought I will post a few swatches - this time from the MAC permanent collection of lipsticks. I don't own very many of the MAC lipsticks, so this is not a "my personal collection of lipsticks" or "all the MAC lipsticks I own/bought" post. The swatches are of lipsticks on display at my local Nordstrom MAC counter. This definitely is not a complete collection of each and every MAC lipstick that has been put out by the very busy brand, but I have covered quite a lot of the lipsticks and am breaking these into smaller posts to avoid photo-overload. Please scroll through or use Ctrl + F to find what you are looking for. All swatches taken under natural lighting. 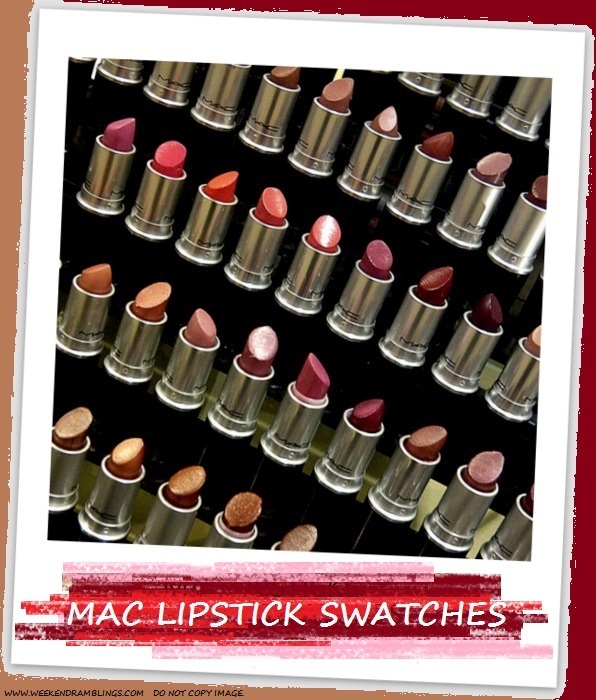 More swatches in Part II of the MAC lipstick swatch series. Note: I do not use MAC foundations, but I have been told I would be an NC45 skin tone. Links provided are for information only and are not affiliate links.